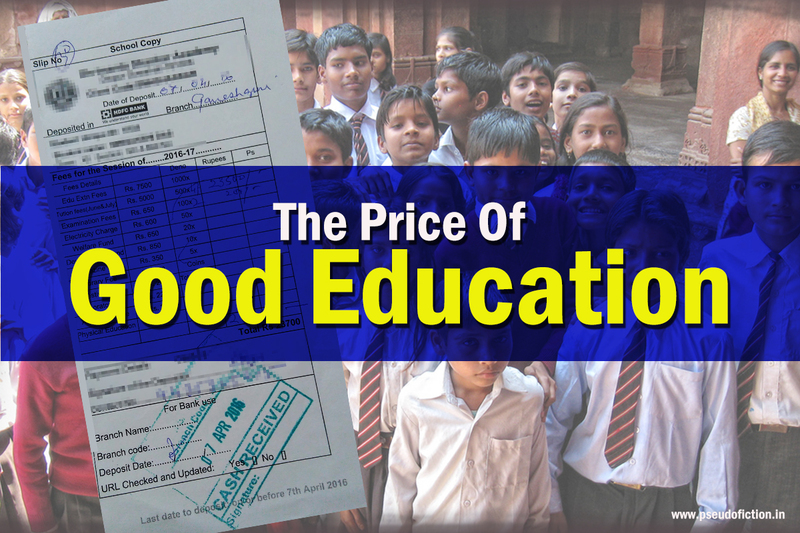 Education in India is a costly affair. Not that it is cheaper outside, but the booming education market in India has started to become a new headache for the largely proportionate middle class of the country. As I write this, a group of students in Mumbai’s Tata Institute of Social Sciences are protesting against the apparent hike in semester as well as the hostel fees. Again, just a few days back when the whole issue of ‘Anti-national’ JNU broke the nation, a group of media intellects focused on the ‘subsidised education’ and the contribution of students to the nation. The larger point here being, education and expenses on education are things which go hand in hand, parallel. Use whatever adjectives you want to, but if education is an investment. The more you invest, better are the chances of your child getting a high yielding job. But like stock market, there are also chances that you might drop it all. Higher education in India, particularly technical education, has become seemingly expensive. Recently the fees of IITs were increased. IIMs are already expensive and keeping to the bandwidth, let us not talk about private universities. The assumption is that these universities offer you placements which ought to cover up whatever you have spent. But many of us do not realize, what an average middle class family goes though for those four or five years when the student is in college. The reason I am particularly using ‘middle class’ is because one would argue that there are scholarships for those who are in need. But not everyone is qualified for a scholarship. There are many like me who fall just outside the scale which determines the applicability of a student for scholarship and things financially aren’t particularly easy for us. It’s not however higher education that I initially wanted to write about. What I wanted to focus more was on school education. And from what it seems, schools have become far more expensive then college education these days, add more to parent’s woes. I wish I had the numbers to back it, but today almost everyone in tier I and tier II cities of the country opts for private education. A good school today is a brand and to be a part of it you have pay. 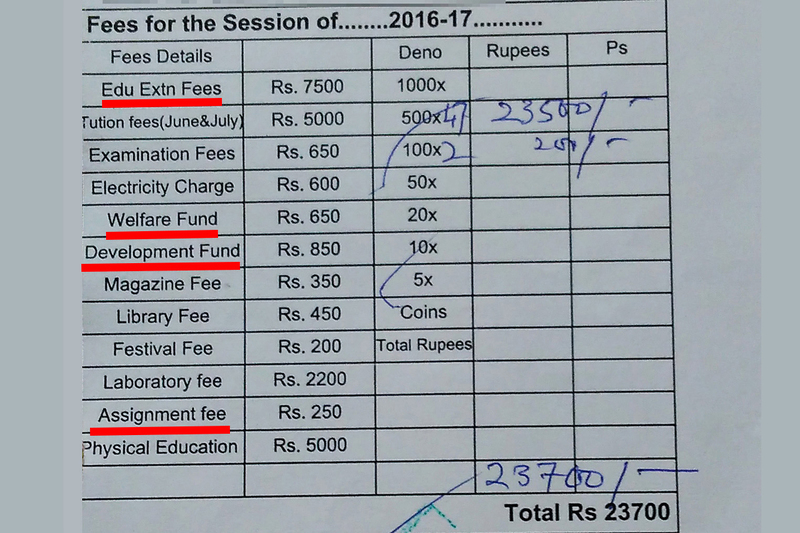 I am not really in a position to comment about other cities, but school education in Guwahati has become an expensive affair. And so much so that admission fees of some schools are way more semester fees of many reputed universities. And must I stress here, admission fees not monthly tuition fees. This tradition that you have to take re-admission every time you pass a class still exists in certain schools and it is kind of hilarious the kind of fees they collect. The picture below is from an admission slip of a reputed private school of the city. 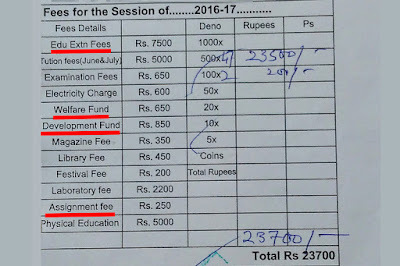 So there is an Education Extension Fees, Welfare Fund and Development Fund. I here failed to differentiate between the purposes of Welfare fund and the Development fund. And added to that there is something called Assignment Fees. I wonder who decides these criteria. What bothers me further is the fact that these numbers fluctuate, mostly in the upward direction. Considering the fact that prices increase or decrease according to the market, but there has to be a transparent mechanism as to how these apparent increases in the fees are calculated. Not sure if there are government norms and regulations available, but criterions like ‘Assignment Fees’ can’t just be inserted. Parent’s today have to shell out a fortune to provide satisfactory education to their kids and on top of that they have to enroll their wards to private tuitions and coaching centres. One might not read about it much, I am sure many in the country are going through this agony of managing school and college fees. At least in college you have groups to protest against these fee hikes, but who takes care of these private schools?